‘BB’ traditionally stands for ‘Beauty Balm’ or ‘Blemish Balm’. These creams are moderately tinted and aim to create a smooth and luminous complexion. Most of the newer creams in the market offer SPF protection so they make for great everyday products, which gives good coverage while shielding you from the harsh sun rays. Effectively, they are great budget buys as they serve the role of primer, serum, moisturizer, sunscreen and of course, foundation. ‘CC’ stands for ‘Color Correcting’ or ‘Complexion Correcting‘. These creams can be considered to be more intense versions of the BB cream and generally provide greater coverage. They contain the same primary properties but focus a little more on skin care. They tend to target uneven skin tones, age spots, and fine lines and wrinkles. The colour correcting ingredients also take care of any redness, greyness or greenness that your skin may have. If you are looking for an everyday product with a natural finish, opt for a BB Cream. If you suffer from frequent acne, breakouts, or sensitive skin, the lightweight CC Cream would help your skin breathe better. If you require a product with anti- ageing properties and added skin care benefits, then the CC Cream is your best bet to regain that youthful glow. Remember that these properties vary across brands so do your research before deciding what’s the best fit for you! 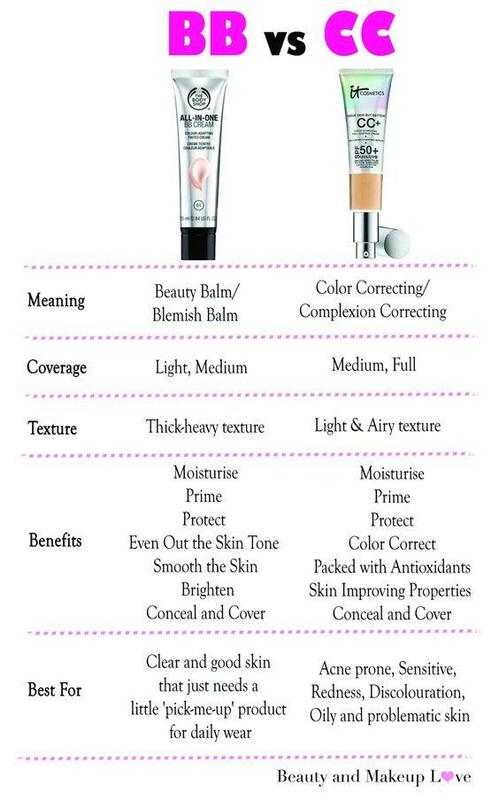 There’s actually no major difference between the two, BB & CC Creams pretty much works the same! BB Creams are usually heavy in texture compared to CC Creams and are best suited for dry and combination skin, CC Creams on the other hand, are lighter in texture and are best suited for acne prone, pigmented, oily skin cause of their light texture, medium-full coverage and color correcting properties! Disclaimer: Graphics’ copyrights reserved © Beauty and Makeup Love and we do not encourage copying or using the images elsewhere on the internet without seeking our prior permission!